The purpose of this study was to investigate relationship between personality and academic achievement of 8th class students doing and don’t sport. 61 participants doing sport regularly and 153 participants who don’t do sport participated to study. Five-factor Personality Inventory was used as data collection material in research. Significant differences between personality were found as gender and situation of doing licensed sport (p<0,05). Besides, there was significant relationship between academic achievement and personality (p<0,05). As result, academic achievements and personality features are influenced by a lot of factor. Extroversion and openness personality characteristics of students who regularly do sports are better than the students who don’t do sports. Academic achievements were found to be better the students who extroversion and openness features are good. Extroversion and openness personality characteristics of students who regularly do sports are better than the students who don’t do sports. Students who extroversion and openness features are good, academic achievements were found to be better. Atkinson, R. L, Atkinson, R. C., Smith, E. E., Bem, D. J.&Nolen-Hoeksema, S. (2002). Psikolojiye giriş. (Çev: Y. Alogan). Ankara: Arkadaş Yayınevi. Corrrea T, Hinsley AW, Zuniga HG. (2010). Who Interacts on the Web? The Intersection of Users’ Personality an social Media Use. Computers in Human Behavior;26:247-253. Courneya KS, Hellsten LAM. (1998). Personality Correlates of Exercise Behavior, Movives, Bar- riers and Preferences: An Application of the Five-Factor Model . Personality and Individual Differences;24(5):625-633. Doğan O, Doğan S, Çorapçıoğlu A ve ark. (1994). Üniversite öğrencilerinde depresyon yaygınlığı ve bazı değişkenlerle ilişkisi. C.Ü. Tıp Fak. Dergisi, 16(2):148-151. Egloff B, Gruhn AJ. (1996). Personality and Endurance Sports. Personality and Individual Diffe- rences, 21(2):223-229. Feingold A. (1994). Gender Differences in Personality:A Meta-Analysis. Psychological Bulletin, 116(3):429-456. Tomrukcu B. (2008). A Study of Relationship between Five Factor Personality Traits and Work Values. Eskişehir Osman University, Social Sciences Institute. Master Thesis. Yazgan-İnanç, B. ve Yerlikaya, E. E. (2008). Kişilik Kuramları. Ankara: Pegem Akademi Yayıncılık. Williams P. A., Haertel, E. H., Haertel, G. D., Walberg, H. J. The impact of leisure time television on school learning: A research Synthesis. American Educational Research Journal 1982; 19:19-52. ISNAD SAYGILI, Gizem , ATAY, Emrah , ERASLAN, Meriç , HEKİM, Mesut . "DÜZENLİ OLARAK SPOR YAPAN ve YAPMAYAN ÖĞRENCİLERİN KİŞİLİK ÖZELLİKLERİ İLE AKADEMİK BAŞARILARI ARASINDAKİ İLİŞKİNİN İNCELENMESİ". 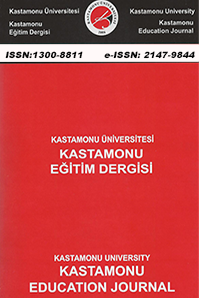 Kastamonu Eğitim Dergisi 23 / 1 (January 2015): 161-170.